Same as it ever was…Same. As. It. Ever. Was. Is it me or does the doofus who says, “I’m the Decider” seem lost in a ‘Talking Heads’ sort of spin zone? Sept. 8 (Bloomberg) — President George W. Bush said he is as committed as ever to keeping up the fight against insurgents and terrorists in Iraq after meeting with U.S. military personnel wounded in the conflict and their families. “My resolve is as strong as it’s ever been,” Bush said at Hickam Air Force Base in Hawaii during a refueling stop on his way back to Washington from Sydney, Australia, where he attended an economic conference. Filed under: Banging Head Against the Wall, GWOT, Iraq |	Comments Off on Same as it ever was…Same. As. It. Ever. Was. I saw something like THIS while sitting at the stoplight at Glenwood & State; I was turning onto Glenwood and saw it dead ahead. I saw it yesterday tooling up ‘The Connector’ out from downtown as I was headed in to downtown to work. Of course, I investigated! I thought there might be the likelihood of getting free chocolate – are ya kiddin?! But, oh dear – it pulled into the Wal-Mart parking lot and began setting up ‘shop.’ I’m not even enough of a Wal-Mart fan to enter their parking lot. I just thought the Kissmobile just too delightful to pass up mentioning although the one in Boise is more like the photo below. I would just add a purple one to the mix, maybe the ‘cab’ part of the – vehicle. Hershey’s has teamed with the Children’s Miracle Network, and the Kissmobile tours advertising that. 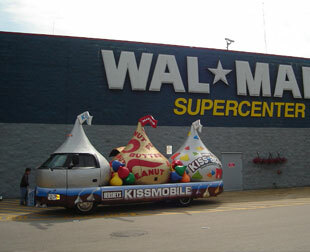 This Kissmobile is parked at the Wal-Mart store at Glenwood & State at least for awhile. The HERSHEY’S KISSMOBILE Cruisers and crews will visit children’s hospitals, participate in parades and festivals, make retail store visits, and of course, give away plenty of HERSHEY’S KISSES brand milk chocolates. People will have an opportunity to have their picture taken with the KISSMOBILE Cruiser for a modest donation to Children’s Miracle Network. All funds will be donated to the local Children’s Miracle Network hospital.